Last night, we convened the 7th annual Dare to Dream event, the major fundraiser for Youth Outlook. It was the first time in several years that there were no accidents or suicides among the youth served in this agency on which for us to reflect. Last night, we wanted to play. As usual, I drafted some welcome comments for the program booklet and gave it a new twist, using quotes from Oscar nominated and Oscar winner movies to tie to our theme, A Night at the Y’Oscars. The creative geniuses that design the theme and decorations this year were at the top of their game, as always on this evening. 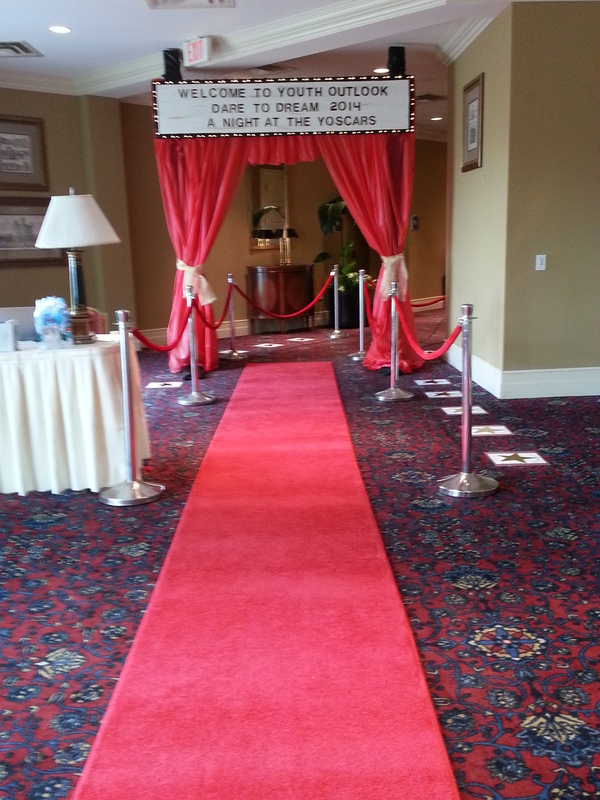 The entrance to the event was taken over by red carpet and red velvet ropes along the Walk of Fame of all of the previous Dare to Dream honoree names imprinted on gold stars. And as usual, I gave the “state of the agency” address, geared to the many newcomers this year and told them a bit about our evolution. Then I put on my best game show host attitude and challenged the “audience” to play along with me, naming the movies from which those quotes I’d found came. To those of you who played along with me last night, a big thanks! For the folks who weren’t there with us, maybe I’ll see you next year! And now…without going to IMDB, how many of the quotes following can you place? I have occasionally compared Youth Outlook’s growth to a scene in Jurassic Park. Do you remember that scene where Dr. Grant holds the baby velociraptor in his hands when everyone first tours the facility, and the tiny raptor looks at him and “meeps”? It’s adorable. An hour later, a grown up version of that same animal is on a quest to eat everyone in sight and it’s no longer adorable. She doesn’t even give the characters a fond, “Here’s looking at you, kid,” before biting into them. I joke with new volunteers that once upon a time, Youth Outlook was this cute little agency, looking around DuPage County innocently and meeping. And now, sixteen years later, although Jurassic Park did not make it to the Oscars, this agency is definitely on a quest! Whatever our quest, whatever we are inspired by, I must not neglect to tell you about the element of humor that runs through everything we do. Dare to Dream is often a somber affair. Tonight, we shall play. Starting with this writing, I invite you to feel the humor and the warmth of the community, the excitement of the quest. Just please don’t ask the silent auction team about me standing over them as they worked to get ready for tonight, repeating, “It puts the lotion in the basket or it gets the hose again.” Yeah. We can just skip that part! As a final note, to the youth leader I spoke with after the game show ended, I meant what I said. Promise me. You are needed here, on the red carpet and everywhere else. Promise me now. Thank you Nancy. I enjoyed the read and getting caught up with the latest of all good things with Youth Outlook. Congrats.